When a person or a group of persons (the group can be of any size) is vaguely knowledgeable about the root cause of his/their problem, he/they will continue to beat about the bush in search of the solution, in which case, he/they sometimes walk into a trap deliberately set for him/them, which will permanently foreclose solving the said problem, leaving the concerned person or group permanently disfigured, if he/they happen to be lucky to be alive. This brief pictograph, as shown above, is the unfortunate situation the Nigerian advocates of PVC as the solution to the jihad, genocide, terrorism, islamization, oppression, repression, intimidation, annihilation, extermination, and occupation being initiated, instigated, sponsored, supported, executed, supervised, and confirmed by the present Muslim Brotherhood called APC led feudal (federal) government, spearheaded by the gangsters at Aso Rock, acting on behalf of their satanic and exploitative masters, Britain, for the retention of the Biafran wealth (OIL AND GAS) which they confiscated since 1970, and has thenceforth been therewith sustained. The determination of the terrorist at Aso Rock, who happen to be acting for, and on behalf of their masters, the predatory Britain, has been to subdue the people of Biafra, and permanently and perpetually possess and inhabit their enormously rich land, and endlessly exploit same for the primary benefit of the parasitic Britain. When they came with many backdoor and subtle strategies and approaches, like grazing Bill, open ranching Bill, Cow colony Bill, and Grazing Settlement Bill, and failed woefully, they understood that many people had become prepared for them, and for that, that approach could not give them the desired outcome. This realization that the people had known their agenda and were opposed to their evil scheme made them desperate to plant their puppets in the states, who, as is usual with the oligarchy, will just take instructions from them, and implement whatever program they have designed, as though in the name of the people. It is this furious desire of planting their puppets that has led to the multi-purpose fatality that Ekiti state has become, including, but not limited to the worthlessness of the PVC, and the futility of relying on it (the PVC), as a weapon of dislodging the gangsters at Aso Rock. Did we not witness the impunity of the terrorist and genocidist at Aso Rock in closing the airport at Ado Ekiti, few days to the conclusion of the gubernatorial campaign, thereby preventing the other party from tidying up their campaign? Did we not witness a repeat of such denial in Benue, as southern and Middle Belt elders were prevented from meeting, by being denied landing rights? Did we not witness the brutality visited on Fayose, a sitting governor in Ekiti state, just to cower and silence him? Did we not witness how the result of the election in Ekiti was already known before the election was concluded, to the point that even the so-called INEC was at discrepancy with itself in terms of the election figures? In this case, what function did the PVC perform? They only want you to come and stand in the sun and be used as a convincing figure to legitimize their charade called elections. Meanwhile, this was just a rehearsal for the main event which is 2019. Don't forget that saying which holds that "it is not those that vote that determine who win elections, but those that count the votes do". This should be very instructive to everyone. 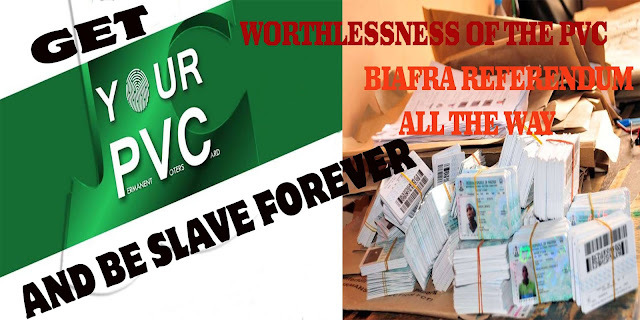 Now, the bottom line remains that the PVC remains of no validity, as much as the advocacy thereof remains baseless, worthless, and inconsequential, as a weapon in dislodging and expelling the terrorist at Aso Rock, in the bid to restore sanity and stability in the devil's cauldron and satanic enclave called Nigeria. The best option therefore remains the total boycott of the sham, the charade, the, drama, the fraud, and the daylight robbery that is called election in the British inhumanity called Nigeria.